‘the most extreme area of the outback’. 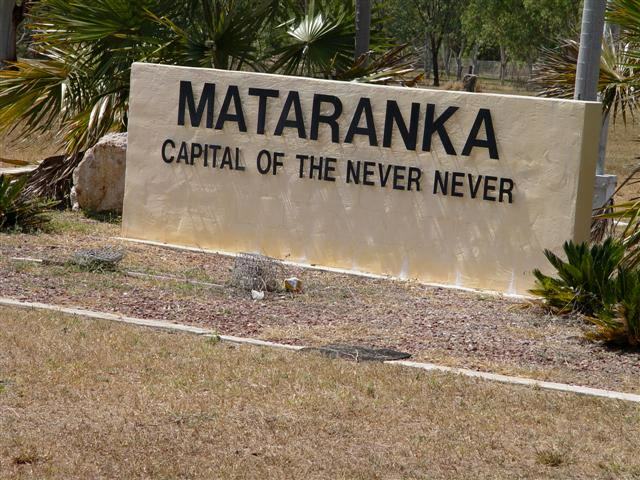 The township of Mataranka, known as the capital of the Never-Never, is about an hour’s drive south-east of Katherine in the Northern Territory. The whole area was made famous in the novel by Jeannie Gunn called ‘We of the Never-Never’. Written in 1908, it is the story of the nearby Elsey Station and the Elsey Station Homestead in the national park is an authentic re-creation of the original. 21 kilometres (13 miles) southeast of town is the Elsey Memorial Cemetery . The cemetery is a significant part of Australia’s heritage. There are graves dating back to 1926 and it is the final resting place of many of the characters made famous in “We of the Never-Never”, including the author and her husband. 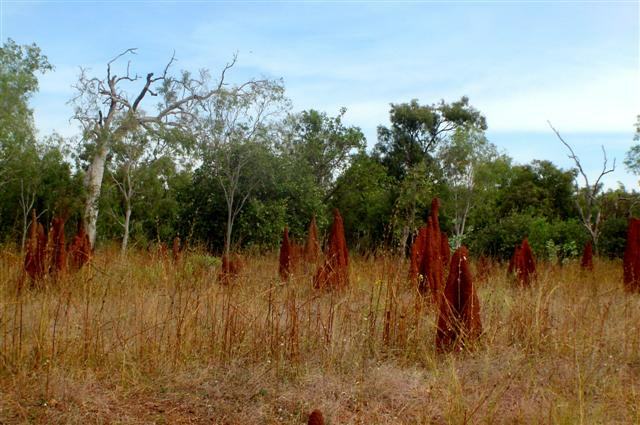 The town was once described by the writer Sumner Locke Elliot as “this lonely strip of barren and seemingly endless sandy waste of ant-hills and stunted trees – thick, hot red sand in the winter time and a sea of mud during the dread Wet”. We arrived in Mataranka on a sunny late autumn afternoon and checked into the Territory Manor Caravan Park ([star][star][star]). We were, unfortunately, too late to see the barramundi feeding but we were told that there were plenty of other things to see and do including the national park and thermal springs. In Elsey National Park, about 8 kilometres (5 miles) from Mataranka, the Roper River meanders through the park and flows through waterholes. Inside the park are some of Mataranka’s famous thermal pools. Korowan or Mataranka Falls is also located inside the national park. Water is redirected into the falls from the tufa dam. A tufa dam is created by lime build-up on the rocks from the spring water. Unfortunately, with only a few hours in town, the 4-hour return trek to the falls was out of the question this time. Instead we opted for a visit to Bitter Springs, a short walk down the road from our caravan park. 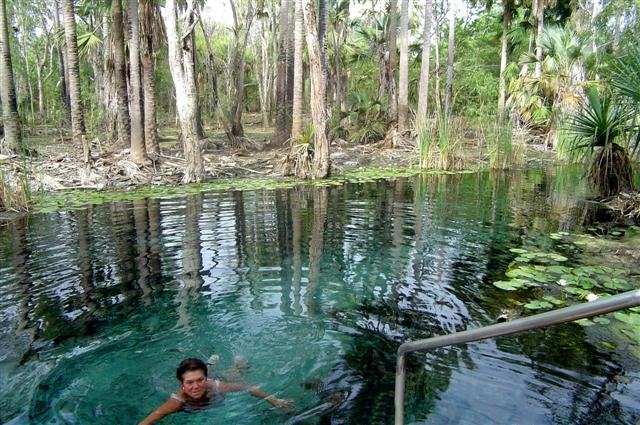 Ringed by paperbark and palm forest, the pools of Rainbow and Bitter Springs bubble at a constant temperature of 34°C (93°F). We went down to the springs for a dip in the thermal pool late in the afternoon. They were not quite what we expected, not that I knew what to expect, but interesting just the same. The water, of course, is pleasantly warm and it is as clear as crystal. I’m not sure how deep it is but we could quite clearly see the bottom, even though we couldn’t touch it. The only down-side was the smell of rotten egg gas and the slime around the edges and on the ladder. The water at Bitter Springs flows from Rainbow Springs at an amazing 30-million litres (793,000 gallons) a day. This tropical, spring-fed thermal pool is just 3 kilometres (approximately 2 miles) from the town and is set in a tropical woodland. The up-side was that John didn’t even suggest throwing a line in! 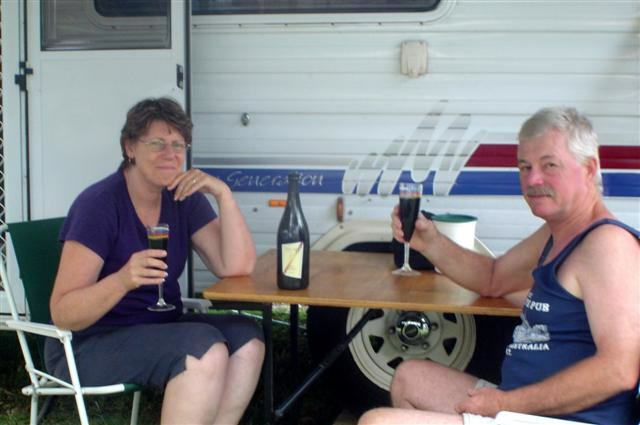 After our swim we returned to camp and settled in for our first night bubbly, this time a bottle of Two Tails Sparkling Wine. It was a pleasant evening and we sat outside in the warm air long after the sun had set. 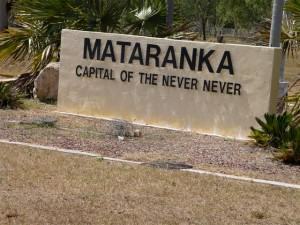 Mataranka is often referred to as being nothing more than a couple of roadhouses and a pub on the highway but there is more than meets the eye. The history, heritage, and cultural diversity, as well as some amazing walking trails entice visitors to stay for a few days and explore this ‘Never-Never Land’. And who knows? Maybe one day we’ll be back and do some exploring of our own.